The 15 F (-9.4 C) weather did not keep the Rochester squash fans from the 2007 final between Jorge Ferreira (Mexico) and Kristen (Kris) Johnson (Scotland). The fans filled the University of Rochester squash facility to see two of the top tournament seeds play. Both players made it through the draw with just one game lost to their opponents. The crowd anticipated a close and exciting match between the 76th PSA ranked Ferreira and the three time Scottish Junior National champion Johnson. After an introduction from the tournament organizer and RSRA board member Mithun Mukherjee the players entered the court for their match. Johnson, lanky and about a foot taller than Ferreira, looked rested and relaxed. Ferreira looked a bit tense, but after knocking the ball around for a few minutes he showed the fluid strokes that gained him winning shots in his previous three matches. Game 1 started with a long two minute rally. Both players worked the rails and cross courts, finding their length and moving their opponent left to right. Ferreira wins the points and picks up the next quickly to go 2-0. Johnson regains his form and works hard to get back to 2-2. Two strokes are awarded to Johnson to give him a 4-2 lead. Both players proceed to hit low hard cross courts and tight rails with Johnson getting the better results. At 6-3 Johnson tries a backhand cross court volley boast but hits the tin. Ferreira takes advantage of the opportunity to catch up 6-6 thanks to additional tins from Johnsonâ€™s attempts at winners. The next point is a long rally with both players attacking and retrieving tough shots in the front corners and in the back. The point goes to Ferreira after his deep tight backhand rail gets past the outstretched Johnson. Johnson fights back to regain the lead at 9-7. At 8-9 Ferreira crushes an overhead volley into the side wall. The game is 10-9 with Ferreira serving game ball. He controls the point with tight shots to the front and ends it with a deep rail to win 11-9. Game 2 sees Ferreira jumping to a quick 3-0 lead thanks to Johnsonâ€™s tin and a Ferreira drop shot and deep rail winner. Johnson regains his form to catch up thanks to Ferreiraâ€™s turn to offer some tin shots to Johnson. At 4-3 Ferreira serves in but ends up getting passed by a low, hard cross court from Johnson. Ferreira gives Johnson two points from his unforced errors into the tin. At 6-4 Johnson is looking confident and working the rails and front left corner drops. A long rally starts. Both players are hitting tough drops and rails, forcing each other to make incredible retrievals. Johnson puts the point away and follows up with a cry of satisfaction as the packed crowd goes wild with cheering. The score is 8-4 in Johnsonâ€™s favor. Despite the exhausting points Ferreira still looks calm and collected. He shows the crowd why he is the #1 seed by staying focused and by avoiding risky shots. Johnson is forced to push harder, but a tin and some well placed shots by Ferreira changes the score to 8-9. Ferreira ties it at 9-9 with a cross court winner. Another deep, tight rail gives Ferreira the lead at 10-9. In the next point Johnson is holding his own until he tries a drop shot from the back corner, missing by a millimeter and giving Ferreira the game 11-9. Game 3 sees Johnson making two errors to give Ferreira a 2-0 lead. Ferreira is looking fresh and strong as he retrieves everything that Johnson hits, much to the crowdâ€™s entertainment. Johnson earns two strokes against Ferreira to get to 2-2. Another error by Ferreira gives the lead to Johnson. But history repeats itself as Game 3 sees Johnsonâ€™s lead end with a focused attack by Ferreira. His constant retrieving is pressuring Johnson to take more risks. Both players trade points before Ferreira pulls ahead for good with great placement to the front and back corners. Some more mental errors by Johnson take the game to 10-5 with Ferreira serving for the match. A great rally begins as both players hit attacking shots. Ferreira puts the game and match away with a deep winner. Ferreira wins 11-9, 12-10, and 11-5 in 50 minutes. The Rochester Squash Racquets Association thanks all of the players who traveled here to play. We wish you good luck in your upcoming matches and hope to see you either in Rochester next year or higher up the PSA rankings. Check out the Photos section for a slice of the action. 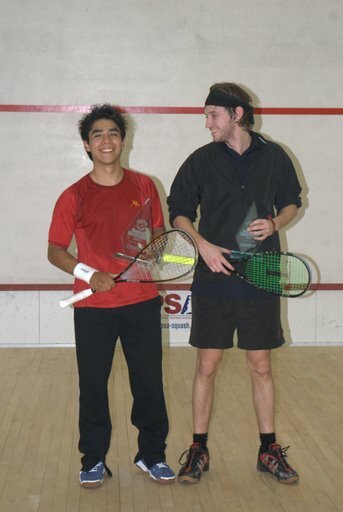 The snowy afternoon and night provided a great excuse to head to the University of Rochester squash courts and watch the first round of the 2007 Rochester PSA Pro-Am. The matches spread were played over three hours with top seeds and qualifiers giving the fans some great squash. In the early matches Imran Khan upset 6 seeded Fernando Lopez (MEX) 11-3,11-7,12-10. A Rochester favorite and familiar face at the Rochester Pro/AM, Imran showed how experience can still hold off youth. In the second half matches the #1 seed Jorge Ferreira (MEX) cruised through his match against Aqib Hanif (PAK) 11-3, 11-7, 12-10. Both players were surprisingly in great form considering one had arrived straight from Mexico City just in time to make his match a half hour earlier and the other had arrived all the way from Pakistan late the previous night. During the match Ferreira looked calm and confident in his movement and shot selection. He worked Hanif around the four corners with lobs, drops, and varied pace on his cross courts and rails. Qualifier James Snell showed his patience over 3rd seed Michael Reid by keeping his rails tight and mixing in low boasts to stretch Reid to the front. Both players kept the pace fast with points being exchanged back and forth in each game. In game 3 Reid pulled out in front only to hit several tins to give Snell the advantage. At 10 – 7 three long rallies ended in lets. On the fourth try Reid misplaced his low rail into the tin to give Snell the win. The left handed Johnson played steadily through all three games, winning 11-7, 11-9, and 13-11. His patient rails and periodic boasts kept Ingham off his step enough to create unforced errors. Kristen was able to keep his errors to a minimum and cruise through to the quarterfinals. Qualifier Tasker-Grindley started slowly but pulled out a tough win against the tenacious Thompson. The first point of the match lasted three minutes and left Tasker-Grindley out of stride. He hit tins five times to give Thompson a quick 5-1 lead. Tasker-Grindley got his act together and regained his composure to win the game 11-7. He completed his work with an 11-9 score in game 2 and 13-11 in game 3. After the last match of the day, everyone headed over to the sports bar in Karen and Cole Behringer’s lovely house. Great food and great hospitality made for a fun evening and gave the Rochester squash fans a chance to mingle with these young professionals and get to know them better. Thanks again to the Behringers for hosting such a wonderful evening. The players seemed to enjoy it immensely. With qualifier action under way, Rochester was treated to a sneak peak of what the rest of the squash world is to expect in the years to come. This qualifier draw on Thursday was teeming with world class junior talent most of who have represented their nations in the junior rankings emerging as champions and are now making their way into the senior squash circuit. The morning session saw one of the three locals and also a UR squash team member, freshman Jim Bristow, comfortably make it to the next round beating Colombian Esteban Espinal. Jim met fellow Englishman, Chris Tasker-Grindley in the next round and fought through a long and breathtaking first game. In the end Chris prevailed and took the match to qualify for the main draw. Another young lad from England (and probably the youngest in this tournament), Alex Ingham, shone in his first ever PSA match overcoming Ben Oliner through some very patient rallies and a hard fought match. He continued his great form in the evening beating Arturo Castillo from Mexico to end the day on a successful note and enter the main round. Rochester prediction: Watch out for Alex Ingham in the years to come! Canadian Matt Serediak overcame young Karim Samy from Egypt who had earlier won his first match against UR team member Yohay Wakabasyashi. But Karim wasnâ€™t having the best day trying to ward off an illness and finally succumbed to Mattâ€™s play. The Englishmen were having a great run as James Snell continued his great form from the morning to beat Bernard Reid and earn a place in the main draw. For pictures/video of the qualifier action check out the photos section. All players and hosts, please note that the pro qualifier draw is slated for 10:00 am on Thursday 01/18 morning. All qualifiers are expected to be present 10 minutes earlier at 9:50 am at the UR squash courts. And on Friday night, come mix and mingle with the players, hosts and Rochester squashers after the first round play. Thanks to our host Karen Behringer for offering to host this party at the perfect sports bar downstairs in her lovely home. Amateur draws are online here. As we enter the last stretch before tournament week, the stage is set once again to welcome professional squash talent from all over the world. With a stellar young crop of professionals coming in this year, be prepared to see some fresh faces and exciting squash next week. To join in the action, don’t forget to sign up for the amateur city championships. Also planned is a social event on Friday night to mingle with the players and community. Many thanks to our host, Karen Behringer. More on this soon. Another round of acknowledgement and thanks to our housers and sponsors this year.